Seitz: What Could Luck’s Cancellation Mean for Game of Thrones’ Horses? Nick Nolte in the now-shuttered Luck. HBO had to cancel Luck. When a third horse died early in the production of the show’s second season — two others died during the making of season one — there was no other course of action. Suddenly a question that had simmered deep in the background of discussions of the series — Is it morally defensible to risk animals’ lives to make art? — threatened to become the only topic of discussion, persisting for however long the show might have ultimately run. I can imagine the moral calculus that series creator David Milch, a longtime horse owner and racetrack denizen, must have gone through when news broke yesterday that a horse had suddenly reared up during what apparently was a routine walk, fell backward, hit its head, and was euthanized on a veterinarian’s orders. When I visited the headquarters of Milch’s production company, Red Board, a couple of summers ago, a few months before HBO green-lighted production of the Luck pilot, Milch proudly showed me the saddle of a champion thoroughbred he owned, waxed lyrical about the power and beauty of the animals, and asked me a question that eventually found its way into the mouth of the show’s lead character, Chester “Ace” Bernstein: “Have you ever looked a horse in the eye?” You can’t continue to look horses in the eye if you’re producing a show that regularly claims their lives. And even if Milch and co-executive producer Michael Mann had fought to keep making the show, HBO executives would have had to face the prospect of continual picketing by animal rights activists at Santa Anita, where the series was shot, and risked having horse dung tossed at them on the way into Time Warner shareholder meetings. And Time Warner stockholders whose kids take riding lessons might eventually have been asked if it were true what the other kids at school were saying: that Luck was a show that killed horses. I don’t believe the conspiratorial argument that HBO was secretly looking for an excuse to cancel the low-rated show and seized on the third horse’s death as a sort of force majeure that gave them the means to finally do it. That argument seems ignorant of how HBO operates. The cable channel’s success is driven by subscription renewals, not ratings, and they re-upped the series for another season in January, right after the pilot premiered. The December preview and official January premiere of the Luck pilot each drew about 1.1. million viewers, roughly half the audience for the debuts of Game of Thrones and True Blood, and about a fifth of what Boardwalk Empire managed its first time out. If HBO cared that deeply about ratings, it would not have renewed Luck right out of the gate; nor for that matter would it have stuck with Treme and Bored to Death, which drew comparably small audiences, over several seasons. 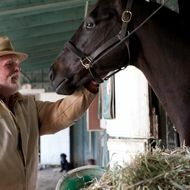 Production on season two of Luck started immediately to take advantage of a window of availability at Santa Anita. By the time that third accident happened, scripts had been written, contracts had been signed, shooting had commenced, and money was being paid out to the cast and crew. Pulling the plug on Luck probably cost HBO tens of millions of dollars. This looks like a rare corporate decision made out of horror. As for the animal rights issue, either you think horse racing should be legal or you don’t, and if you don’t think it should be legal, you never approved of Luck from the start, much less wanted to watch it. But now that it’s kaput, where does that leave us? I can see this cancellation sparking intense arguments about the morality of using trained animals in filmed fiction. If Luck was, by virtue of its subject matter and setting, innately cruel to animals — and I’m not convinced that it was — are Game of Thrones and AMC’s western Hell on Wheels guilty of similar but slightly lesser crimes? Should Steven Spielberg have not directed War Horse, which used real horses in a number of major sequences, some of them complex and potentially dangerous? Should westerns and sword-and-sorcery films go horse-free from now on or not be made at all? Should there never be another film or TV show set at a track? I don’t know exactly where such a discussion might lead us, but if I were a betting man, I’d put my money on CGI.